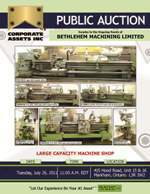 Corporate Assets Inc. | Bethlehem Machining Limited - Corporate Assets Inc. FEATURING: TOS SN63C- 25/35” X 168”gap bed engine lathe, STANKO (1998) IMG 63G-28/40” X 120” gap bed engine lathe, TARNOW (1980) TUJ 50M 3000-22/30” X 120” gap bed engine lathe, TARNOW (1987) TUJ 50M 1500- 22/30” X 60” gap bed engine lathe, TARNOW TUJ 48M 1500- 22/30” X 60” gap bed engine lathe, FORWARD (1997) VS 800 vertical mill, (2) BRIDGEPORT vertical turret mills, KB roll in type vertical band saw, FREDERKSSUND 200 10” power hacksaw, MITSUBISHI 5000 lbs. LPG forklift, INGERSOLL RAND 5 HP air compressor, CAMPBELL HAUSFELD 2 HP air compressor, MECATECNICA PHVD320 12.5” rotary table, LINCOLN AC 180 stick welder, KEETONA K2 6” hand shear, KING KSD 340 drill press, ALSO: inspection equipment including, micrometers, gauges, verniers, etc., perishable tooling & tool holders, bench grinders, engine hoist, mild steel inventory, office furniture etc.